A Palestinian teenager was shot dead by the Israeli army during renewed clashes on the Gaza border Friday, the health ministry in the Hamas-run strip said. Several thousand demonstrators approached the border in multiple locations Friday evening, AFP correspondents said, the latest in months of often violent confrontations. At least 45 people were injured by Israeli fire, the ministry said. East of Gaza City balloons attached to incendiary devices were again flown across the border, after being largely absent in recent weeks. The balloons have started hundreds of fires inside Israel, causing major damage to farmland. The Israeli military said in a statement that its aircraft targeted two Hamas observation posts after a grenade was thrown and "security infrastructure" damaged. It said thousands of "demonstrators and rioters" had gathered along the border, with some of those involved burning tyres and throwing rocks, incendiary devices and a grenade. Troops responded with "riot dispersal means" and no Israeli personnel were injured, the statement said. 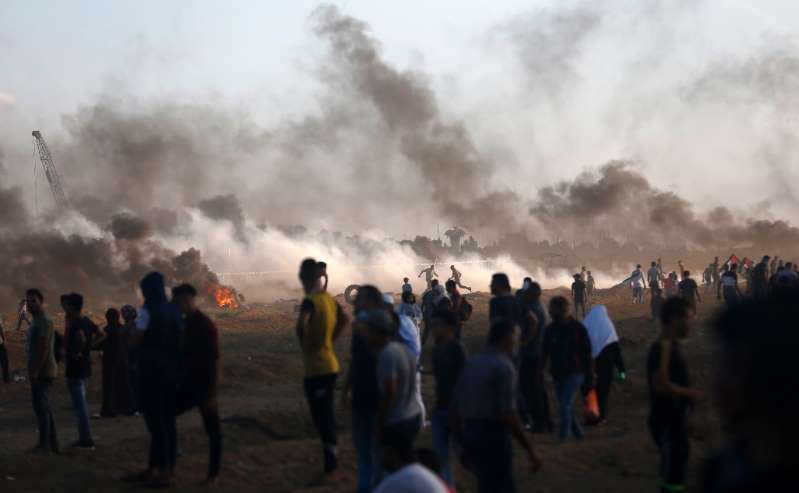 East of Gaza City protesters used a net to capture an Israeli drone carrying tear gas cannisters, an AFP correspondent said. Earlier Friday a Palestinian succumbed to his wounds, two months after being shot during protests, Gaza's health ministry said. Amjed Hamdouna, 19, was wounded on July 14. At least 174 Palestinians have been killed by Israeli fire in Gaza since protests broke out on March 30. The protesters are calling for Palestinian refugees to be allowed to return to the homes they or their relatives fled in the 1948 war surrounding Israel's creation. Israel accuses Gaza's Islamist rulers Hamas of manipulating the protests and of seeking to use them as cover to carry out attacks. The Jewish state this week closed the only people crossing with Gaza after violent protests damaged the site. It said it would reopen the passage next Thursday providing the situation is calm.